The dual wielding inquiring about the glowing eye's glowing eye. I KNOW WHY!!!! OOO! PICK ME! random guy: why is your head so big? big headed guy: shut up! big headed guy: shut up!! random guy: I want to know why? 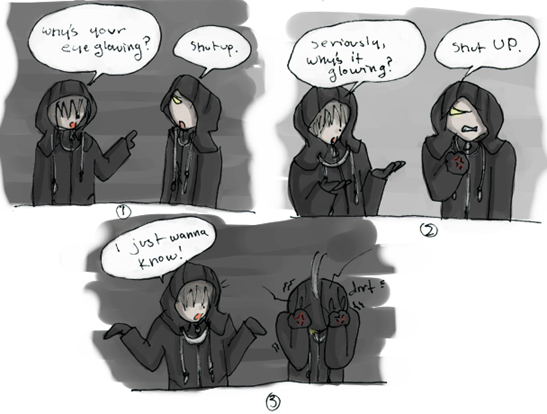 I bet you this is just what goes on when the members of the 13th Order are sitting around bored out of their minds. Can you imagine some of the questions they must ask (each other)? This 1 being the a great example, of course. Glowing Eye: Don't even go there!